1. I’ve written about my 3x great grandmother, in this post Shipwreck Survivor Ellen Mary Chamberlain. As the title says Ellen survived a shipwreck, the loss of her first husband, the death of three children, the death of her sister in a horrible accident, having eleven children and caring for five of her second husband’s children, going through insolvency with her second husband and more!!! I have nothing to complain about. 2. I’ve been so blessed to find and meet several cousins and the surprising thing has been the amount we have in common although we had never met and lived in different states!! 3. A Tragic Story With A Happy Ending is about Linnea Percival who lost her first husband only eleven days after their wedding. 4. It’s humbling finding so many ancestors who were willing to go to war for their country. 5. I’ve heard about my first cousin (3 times removed) Leo Buring all my life but I didn’t know that his wife Ida Agatha Sobels’ nick name was Nay, that they named their property in an outer suburb of Sydney in New South Wales, Leonay and then the suburb was named Leonay. 6. Some libraries here in South Australia are terrific and some are terrible. I don’t like being treated like a thief. One library has their family history resources in locked glass cabinets and you have to ask for them to be opened each time you want to take something out or put something back. I know that precious resources have been pinched from libraries but there has to be a better system than this. In direct contrast another library has their resources out where everyone can access them. 7. The RootsWeb AUS SAGEN mailing list is wonderful. The people go out of their way to help with queries and look ups. Focusing on South Australia. 8. I’ve been quite surprised not to find any convicts amongst my ancestors so far. 9. I never thought that I would enjoy visiting cemeteries so much or that I would feel a connection with the people I’m researching and the places they lived, here in Australia and the UK. I’ve been surprised by my own tears too, shed for babies born too early, children dying too young and young men going off to war and not returning. 10. Rev. Charles Tregear worked for many years in the field of Social Justice. He established the South Melbourne Mission, worked for changes in liquor and gaming laws, served as a chaplain during World War One and was known as a distinguished social reformer! Lots of the people I wanted to nominate had already received this award. Oh well I’ve failed at the challenge but I will keep looking for more genealogy blogs!! Thank you for giving me this award, but I too have already received it once. And, as a rule, I don't 'do' awards. But thank you for reading my blog and thinking of me. I hope you'll continue to visit. First – Thank you for the kind recognition. I greatly appreciate it. That's fine JM, I'll certainly keep reading your blog too!! 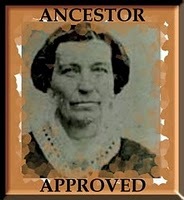 Thank you for thinking of me for the Ancestor Approved award. Like J.M., I don't usually 'do' awards. It's mostly because I find it hard to think of the ten things and the ten blogs. It shouldn't be hard, there are plenty of great blogs out there! Once again, thank you for the nomination. Yeah I failed at finding 10 genealogy blogs, I guess I could've Googled some but I went with ones I knew of already.